Jakarta, the capital of Indonesia, is a metropolis with chaotic traffic and levels of pollution above the recommended, making those who live in it flee occasionally, looking for fresh air and quietness. And that's where Pulau Macan (which means Tiger Island) comes in - the island is a perfect weekend getaway to escape the hustle and bustle of the city. Crystal clear water, a white sand beach and relaxation are waiting for you in this little gem. In this post, you will find out where to stay, how to get there and what to do there. There is only one place to stay on the island, which is Pulau Macan Village & Eco Resort, a sort of guesthouse with packages that include full board and unlimited access to water, tea and coffee. They have two isles: the largest (Pulau Macan Besar), where all the facilities are, and the small (Pulau Macan Kecil) which is next to the other and is where you can get away and relax a bit more - it can be accessed after a walk, if the tide is low, kayak or stand up paddle. For couples, the Driftwood Huts are the best options to stay because they accommodate up to 2 people – as the name suggests, in them it is possible to find the driftwoods that make up the decoration of the entire place and the absence of doors and keys, which give a feeling of freedom (don’t worry, it is safe and you will have a curtain that guarantees privacy). Being in one of them you can access the sea through your own staircase and relax on the private deck with sun loungers, where you can watch the beautiful sunset while watching the boats go by, taking back the groups that go to the nearby islands just for a day trip from Jakarta. At night, when sitting on the porch, you can see the planktons and luminescent fish that eat them illuminating the water around. One negative point is that this option does not have a private bathroom, but there is a shared one located a few steps away from the rooms. If you plan to go with family or a group, there are larger accommodations that can fit from four up to seven people. But please note that the rooms do not have TV or air-conditioner. On the other hand, each accommodation has a fan, and the cool breeze that comes in from time to time is perfect to remind us that we are not in the big city anymore. Pulau Macan is in Java, on the north coast of Jakarta, and is accessed after a journey that takes from 1.5 to 2 hours on boats that depart around 8 am from the Ancol Marina (it is possible to reach the marina easily by taxi, from anywhere in the city). If you choose to stay in the accommodation above, the package already includes the sea transportation and, on the way back, the boat will leave the island at 2 pm. Snorkeling (which can be done around the two islands or on short trips that are planned by the guesthouse and depart once a day, depending on the weather), kayaking and stand up paddle are the main activities of the place. 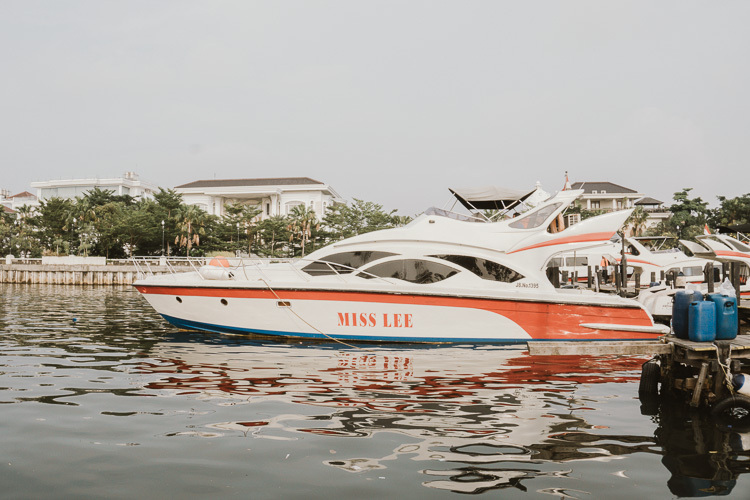 The daily rate includes use of the equipment, which you can use to stroll through the calm waters, or go to Pulau Macan Kecil, and enjoy the privilege that guests have - you can go back and forth from there as many times as you want, while visitors need to pay a fee to have access – place your towel on the beach, walk on the white sand, see some of the marine life near the coast and watch the boats taking visitors to the neighboring islands (people on board will probably wave as they pass by). As the Pulau Macan Village & Eco Resort is the only place to stay on the island, I advise you to book your stay at least two months in advance. And I recommend staying at most two nights (I only stayed one and it was enough). Take a water shoe to get into the sea (but if you do not have, they can lend it) and do not forget the sunscreen and sunglasses. Do not take plastic to the island - on the way there, and even in Ancol, you'll see the impact of the rubbish that people throw at the ocean. Always make sure to take the garbage you produce with you and dispose of it as best as you can, whether in Pulau Macan or when you return to Jakarta. If you want a quick way to get away from the pollution and madness of Jakarta, Pulau Macan is a great choice.